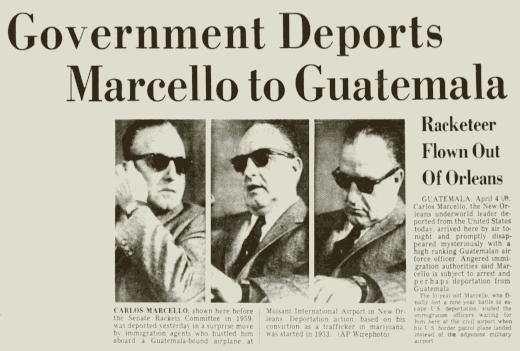 U.S. immigration officials arrested New Orleans Mafia boss Carlos Marcello on April 4, 1961, and immediately deported him to Guatemala. Reporting for a quarterly alien registration at the Immigration and Naturalization Services office in New Orleans, Marcello was confronted with a government document that indicated he was born in Guatemala in 1910. He was then handcuffed, loaded into a law enforcement automobile and whisked, sirens blaring, to the airport. He was not permitted to speak with family or to pack a bag. He was put on a U.S. government plane and transported to a military airport in Guatemala City. The trip was the culmination of a nearly decade-long government effort to deport the mob boss. Marcello was known to have been born in an Italian colony in Tunis, North Africa, and to have been brought into the U.S. by his parents when he was a baby. Attempts to deport him were repeatedly blocked by legal maneuvers and international disagreements. Though he was an Italian national, Italy refused to accept him. Tunisia wanted nothing to do with him. France, which held Tunisia as a protectorate until the mid-1950s, also refused to take him. The Kennedy Administration learned that Italy's refusal was linked with rumors of a Guatemalan birth record for Calogero Minacore, Marcello's birth name. Officials determined that Marcello had the fake birth record created to protect himself from deportation. The scheme backfired when the Administration obtained a copy of the birth record and used the document to justify shipping him to the Central American country. While Marcello's U.S. attorneys worked frantically but unsuccessfully to have him returned, Guatemala quickly proved that the birth record was fraudulent and decided that Marcello had to go. As the Guatemalan government tried to set up its own deportation, Marcello disappeared. 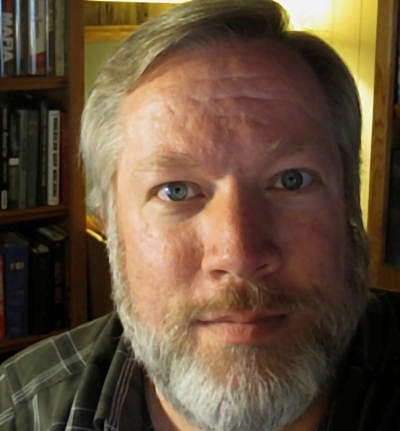 The crime boss resurfaced in Metairie, Jefferson Parish, Louisiana, in June. "'They kidnaped me,' charges Marcello," Monroe LA News-Star, April 7, 1961, p. 1. "Bulletin," Alexandria LA Daily Town Talk, April 4, 1961, p. 1. "Government deports Marcello to Guatemala," Shreveport LA Times, April 5, 1961, p. 1. "Guatemala orders ouster of Marcello," Lafayette LA Daily Advertiser, April 27, 1961, p. 15. "Marcello faces deport orders in Guatemala," Lake Charles LA American Press, April 5, 1961, p. 1. "Marcello giving little assistance to lawyers," Lake Charles LA American Press, April 6, 1961, p. 1. "Marcello jailed in Orleans on charges of illegal entry," Shreveport LA Times, June 6, 1961, p. 1. "Marcello returns to U.S.' believes in Shreveport area," Shreveport LA Times, June 2, 1961, p. 1. "Police arrest N.O. racketeer in Guatemala," Shreveport LA Times, April 22, 1961, p. 1. "Racketeer fights to void deporting," New York Times, April 5, 1961. "Robert Kennedy promises action on Carlos Marcello," Lafayette LA Daily Advertiser, March 23, 1961, p. 13. "Start move to deport Orleans crime figure," Shreveport LA Times, Dec. 31, 1952, p. 1. "U.S. acts to end Marcello stay," New Orleans Times-Picayune, Dec. 31, 1952, p. 1. "U.S. is assailed on deportation," New York Times, April 6, 1961. "U.S. upholds Marcello ouster; rejects plea to bring him back," New York Times, April 16, 1961. Davis, John H., Mafia Kingfish, New York: McGraw-Hill Publishing Company, 1989. Kennedy, S.A. Regis L., "Carlos Marcello," FBI report, file no. 92-2713-272, NARA no. 124-10205-10439, Feb. 7, 1962. Milliner, Louis, "Marcello family returns to U.S.," Alexandria LA Daily Town Talk, May 4, 1961, p. 21. SAC Milwaukee, "Carlos Marcello AR," FBI Memorandum to Director, file no. 92-2713-299, NARA no. 124-10206-10310, March 24, 1962. Wagner, Susan, "Lawyer charges 'Gestapo' tactics in Marcello ouster," Alexandria LA Daily Town Talk, April 5, 1961, p. 22.